UPDATE: Community Manager Kaivax clarified that purchasing the Interdimensional Pet Portal will require already having used the Pocket Pet Portal. Additionally, it's possible we'll see other ways to earn Polished Pet Charms in the future. It should be noted that the Enchanted Tiki Mask (pictured right) is not actually new. It was added to the database at BFA's release. The recipe to craft it and its Pet Journal entry were not yet implemented at the time, but Enchanters will finally have a way to create this neat companion in Patch 8.1. The Pet Journal entries for most of these pets seem to be somewhat incomplete, so it's not entirely clear how we'll obtain each one. There is also an interesting schematic for Engineers, Schematic: Mechantula. The recipe itself says it creates a follower equipment item, however a pet named Mechantula (not included in the PTR Pet Journal at the time of this article) was datamined. We'll have to wait for a future PTR build to see if this schematic will teach Engineers how to craft this pet. We'll have more updates as the PTR continues, so stay tuned! 1. Automated Defenses - The automated defenses of Gnomeregan have been activated! 2. Out of Control Elementals - Defeat the Living Elementals. 3. Pull the Correct Levers - Use the correct sequence of levers to activate the Door Control Console. 4. Bypass the Mine Field - Ride the Bomb Stomper 5000 through the deadly field of Bomb Bots. 5. Resilient Critters - Defeat the critters that somehow survive in this place. 6. You Dirty Rat - There's a Leper Rat of unusual size guarding that door. It looks mean. 7. Gnomeregan Defense Force, Activate! - Defeat the Gnomeregan Defense Force. 8. Shadowy Figure - Someone has telepoted into the room. Confront them! 9. Thermaplugg's Latest Invention - Mekgineer Thermaplugg has left his latest invention here as the last bastion of defense for Gnomeregan. Smash it! Datamining also revealed that there will be a new currency tied to the Gnomeregan Pet Dungeon, Pristine Gizmo. A new vendor, Micro Zoox (pictured right), can be found at the entrance of the Gnomeregan dungeon. 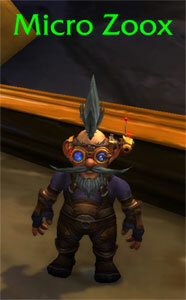 He currently sells Unopened Gnomeregan Supply Box and Schematic: Mechantula. It's possible that new pets will appear in his inventory, and players will be able to purchase them in exchange for Gizmos. We'll have to wait and see! If you're having trouble finding space for all of BFA's new pets, this one's for you! 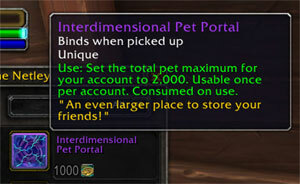 Last but not least, the recent PTR update added a new item, Interdimensional Pet Portal. This item upgrades the Pet Journal to allow 2,000 total pets! Currently, it is sold on the PTR by the same BFA vendors that sell the new pet toys, and costs 1,000 Polished Pet Charms. It does not require having learned the previous journal upgrade, Pocket Pet Portal, at this time. No other requirements are necessary to learn the new Pet Portal. Keep in mind this might be subject to change. It is still fairly early on in the PTR phase, so we expect to see changes, updates, and hopefully even more pet additions in future builds. Interdimensional Pet Portal is a neat addition, but it's kind of silly that it costs the same 1000 Polished Charms as they made Pocket Pet Portal to cost in BfA. If the previous rank is not needed, then Pocket Pet Portal is obsolete and whoever has acquired it in BfA will be very angry. Spawn of Krag'wa. Could possibly be related to the achievement Hoppin' Sad ... ? Where you have to /shoo the spawns of Krag'wa away from 10 different area's in Nazmir. I really hope the box is not the only way to get battle pets... RNG is so rough sometimes. I liked the Deadmines method much better than the Wailing Caverns.